I enjoy watching movies as cultural products in which we relish much that is true, good, and beautiful, while we also discern much that is a fruit of humanity’s corrupt heart. 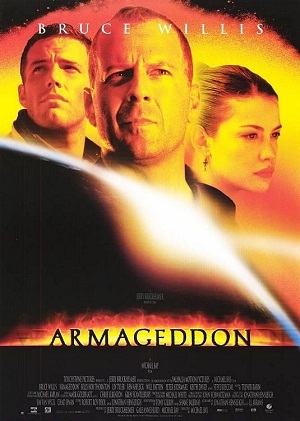 A case in point of the two streams of falsehood and truth in the same movie is the 1998 blockbuster Armageddon. Armageddon is an example of the narrative of salvation which is so popular in Hollywood movies. The plot goes like this. An asteroid (a huge mass of rock from outer space, also called a ‘minor planet’), about two-thirds the size of Nigeria, is on its way to hit earth. Portions have already broken off and levelled major cities. But the main thing is still approaching at an incredibly fast rate. If it hits our planet, everything dies – including bacteria. In typical Hollywood style, America comes to the rescue. The President, the Defense Secretary, NASA – all converge to find a way to deal with the crisis. The best response? Send a team of expert drillers to land on the asteroid before it gets too close. Drill a hole sufficiently deep, insert a thermonuclear bomb, and detonate. This was the plan. And the drillers were the solution. All the world, from Tokyo to Tunis, looked upon this team of elite drillers to save them from impending destruction. Once again, it was the rise of humanity against a hostile universe which threatened her annihilation. As I explained in an earlier post, this is Hollywood’s gospel of a secular salvation. It is a theory of deliverance from the ills which plague humanity, without any reference to God or Sin. True, God is sometimes mentioned or referred to in several of these accounts. But he is often more of a cosmic being who stands by with little control over what is happening or a ruthless tyrant who might have contributed to the crisis in the first place because he simply won’t let humanity be. Whichever way he is portrayed, God simply doesn’t matter. Neither does sin or moral guilt. It is man’s world, man’s challenge, and man’s solution. To put it in theological terms, Redemption is from, for, and through humanity. And so the story often goes. However, like we often discern in our fallen world, God’s grace often shines in some of the least expected places. In a cinematic ode to human skill, ingenuity, and planning, the message of the cross still speaks, howbeit in a whisper. For at the crucial moment, after the bomb had been buried in the drilled crater, the crew discovered that the detonator for the bomb was damaged. Meaning? If their mission was not to fail, if their precious universe for which they had come this far was not to perish, someone would have to stay behind and detonate the bomb manually. Someone would have to lay down his life for the world. Although they initially decided who would stay behind via a ballot, it was through an act of sacrifice that the task was eventually carried out. A father sacrificed himself for the good and comfort of his daughter, and ultimately for the peace and safety of the world. So while the political and technological powers had devised their plans and perfected their strategy, it took the lever of sacrificial love to shift disaster into safety. It took the death of a man for the world to live. How powerfully this speaks of Christ and his death on the cross! When we were yet sinners, deserving and expecting not the chance collision of an asteroid, but the moral, holy, and just wrath of our Creator, that same God stepped in as our substitute. He bore our sins in his own body on the tree. And through faith in Him, we can be saved from much more than galactic annihilation; we can be saved from alienation, guilt, and death. The hope for our world does not lie in the steel and concrete complexes of our world; it was displayed on a wooden cross centuries ago when a King sacrificed himself for his subjects, and a God chose to die for his creation.